With Christmas approaching at a rate of knots, the planning application numbers continue to rise. 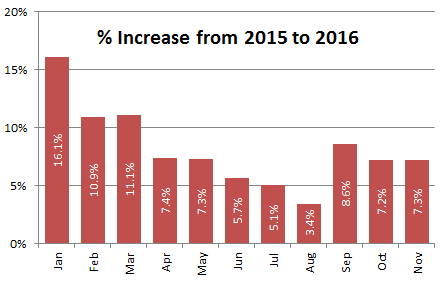 November saw 45,834 applications submitted, that’s an 11% increase on November last year. So far, we’ve seen no sign of the Christmas slow-down, although history tells us that some applications will even go in on Christmas Day! On building control, we’re also seeing an uptake in the number of building control bodies signed up and the number of applications submitted. In the eight weeks since launch, we’ve seen 59 local authorities and 9 approved inspectors go live with the service. In the same time period, we’ve seen around 4,500 building regulations approval applications started. We’re just testing the first post-launch release to the service as well, so as soon as its passed testing, I’ll post an update on what’s included and when its coming here. If your are a building control body and haven’t yet signed up, please do speak to your Account Manager.